We aim to ensure we are offering our customers the best products and services, and we're aware that VStuff (the backup service we offer) has had its ups and downs. I thought I'd share with you what we’re currently focusing on doing to improve it. For example you've told us that the software is difficult to use - which we're fixing with a significantly improved look and feel and far simpler interface. The software's reliability and the VStuff online web site also needs attention - and we're improving those too. In order to upload or download files, V Stuff users connect to a "back-end platform". A number of stability and capacity improvements are being implemented to this platform within the next month. This will vastly improve the stability of the service along with an increase in transfer speeds when uploading or downloading files from and to your online data store. Couple this with the upload speed improvements we're currently rolling out and you'll start to see considerable improvements. The big changes come early next year with the overhaul of the backup software interface and improvements to the website. We've made the changes after listening to feedback from customers and working with them to improve the design – so we're sure you'll find it more intuitive and simple to use. 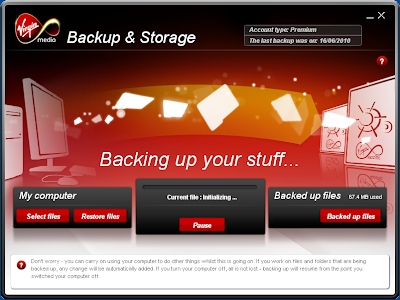 We're also changing what we call things, updating the core software itself, simplifying some of the more complex options in the software to improve usability and rebranding the service to 'Backup & Storage' (it does what it says on the tin!) but don’t worry, the photo service will still be there. We were hoping to have all these major improvements released this year but are taking some additional time on testing to ensure we are as confident as we can be that the experience is brilliant and we fix all issues present today. Here's a taster of what the service will look like, we hope you agree a huge improvement…. We'll be in touch with backup & storage users shortly to let them know when exactly these changes will take place, so please bear with us while we get these improvements rolled out. Improve it Alex? Try just making it work at all!! Hi - You've not given any details on what particular problem you're having, but if it's something not covered by the above do please get in touch with the technical support guys and they'll be able to help. The problem is the seemingly universal one of VStuff not realising that you have upgraded your BB package and that you should have unlimited storage. I am awaiting a response in the vstuff help forum. Thanks for the info - one of the forum team will pick up. For backup I use an external 250GB hard drive. What do I need "the cloud" for?! Completely useless, in my opinion. Carl, what happens when your house burns down and your 250GB drive is gone along with your computer? Alex, I've just started to use Vstuff for backup and have been tearing my hair out at it's uselessness compared to the software I've been using before. My current backups are around 100GB, but at current speeds I doubt Vstuff would ever catch up. Glad to hear things are going to improve. Thanks - we've done lots of work on it. It's a slightly different target audience to FTP software to be fair! Interesting. I don't use the service currently - does it work with Macs? Sure can - see http://www.virginmedia.com/myvirginmedia/vstuff/find-out-more/ for more info. Could a secure interface (ftps/sftp, webdav, rsync or the like) be provided to those that would prefer not to use the windows or mac software please or a formal response stating this is never going to happen. John - Hi. There's no plans for such functionality at this point in time. Wish I had known the service was problematic, and yes I am now experiencing it for myself, before paying for the unlimited storage. I don't think the darn backup is ever going to run to completion without the dreaded 'user and password changed' error. It would be nice to see a fix for the failure to deliver "unlimited" to XXL upgraders. This fault seems to have been outstanding for a considerable time. I am currently trapped in this one, with outstanding requests for a fix. It seems to be a matter of platform support fixing user by user at the moment; not an ideal solution for anyone! good to say about v-stuff ?. Does this update solve the problem of the software constantly asking for username and password and then even when you type it in it says they are wrong. Hope so as the service is useful when it works. As you can see from the blog there's a whole bunch of improvements in progress, so do try it out when it's fully updated! I have give up on this. Its really poor software (see the v stuff forum for typical user complaints). I now use dropbox which is so much better. offering ftp to load the initial transfers would allow us to use the full upload bandwidth we pay for (for a much shorter period of time). my upload is estimated at 159 days (XXL package!). However it crashes every few hours and I have to restart it. so it will be more like 359 days. livedrive is probably going to take over this rubbish and I will down grade my package as I only went to 50mb to get unlimited storage. I may even jump ship altogether as I can get 20mb from other suppliers so you;d lose all the services I currently subscribe to. This will vastly improve the stability of the service along with an increase in transfer speeds when uploading or downloading files from and to your online data store." As it's January 2011, and my back-up has been running non-stop for over 60 hours now, to achieve a mere 65% of it's task (I estimate the task that started on Sunday will finish late on Thursday), I sort of wonder just how slow it was before this massive improvement that is making my upload go so "fast"??? Has anything actually been done yet to the software? Even Microsoft upgrade things faster than V-Stuff's developers (I use the word developer in the sense that they wrote it, not developed it into a working useful program, of course). I am thankful that I decided to test the free 5GB service before going for the upgraded version with more space!!! Cos I'd be demanding my money back if I'd paid for this! Hi - as per the blog we did get some platform improvements and enhancements implemented last year and have seen performance benefits from those, but the really big improvements are to come this year and we're developing and testing these right now. This software is a load of crap. I too upgraded to 50mb on the pretense of the unlimited storage and photos. Being a photographer by trade my images come in at 70 mb a time for a hi-res image. I wanted to keep by images backed up for safe keeping (apx 400 gig) How long will that take to back up!!!! Have you reported this via the help & support forums? Am sure technical support will be happy to help with whatever problems you're experiencing. I have been letting my photo collection slowly get backed up through V-Stuff. As there are 140Gb of files, it is taking a rather long time, but I just accepted that it would eventually get there, and as it just runs as a background task, I didn't have a big issue with it. However, I have now just reached to 100Gb threashold, and while the backups continue to run, the actual usage reported stage I am using is not increasing. Each time I log-on now it hovers around the 100Gb mark, sometimes dropping backwards to under 100Gb. What is happening to my files? I am depending on this backup as my primary fallback position should I lose any of my data! We'd need some more details to look into this and understand it - can you post some details through to support on the V Stuff forum (http://community.virginmedia.com/t5/V-Stuff/bd-p/vstuff) and they'll be able to look into this for you further? It appears as though Virgin have some sort of underlying problem with the V Stuff system as there are many customers who are unable to even activate their accounts. You can read about my attempts to do so here (http://tinyurl.com/4qbz3aw). As noted by myself and others, Customer Support seem unable to even acknowledge that a problem exists let alone help resolve it. Thanks Mark - the product and technology guys are having a look into this one for you based on the forum post and will keep you up to date via that thread. I have been using V stuff as a backup but I have noticed that my broadband connection often fails during the backup (I only use it every few days) Is there a conflict somewhere that I should know about? Well that's weird. Have you reported it in the help & support forums (http://community.virginmedia.com/t5/V-Stuff/bd-p/vstuff) to see if anyone else has seen it and the tech support guys can investigate it? It's significantly faster - will need to check out the actual performance stats though. Hi Alex, I just started using the current V Stuff backup and I'm experiencing all the issues vociferously expounded here :) - appreciate your news re the upgrade, any timescales for go-live? I'm wondering if I need to use an alternate method of remote backup for my precious data in the meanwhile. Thanks! What on earth have I really bought? Is this level of performance acceptable? I would seriously think twice before getting VStuff backup if I wasn't already so invested in it (I have almost 100GB uploaded on my unlimited storage account). Constant login problems, and now it seems not to have been backing up since last August (5-6 months ago), which it should have been doing automatically and appeared to be doing by the nice little icon in my media tray. I don't know what I would have done if we had a computer failure in that time and lost all the photos of our new baby!!!! Total rubbish, wait till they've sorted it then maybe use it. I'm not here to cover R and D till Virgin can make a simple bit upload software work. Hi Guys, sorry for the delay in approving these as had a few days off. Canarydelia - Apologies for this. We're in the final throes of rolling out an update for the software as per the above, so do please try it out once done and let the support guys know if you have any problems when the new release is out. Alex! Can someone contact me from the forum team or tech help? I was on the phone to India aka tech help for 45 mins yesterday. I can't even access v-stuff it states my user name and password are incorrect. However I can access my VM account using the exact same details. I have never been able to use the free photo prints facility, I even tried to access snappish directly, but they don't recognise my account details and want to charge me for prints. Can you put a post up in the forums (where you can also direct message one of the team) with some more info and one of the guys will pick it up? I have a NAS unit that I currently keep all my media files on, some of which I would like to backup using my unlimited storage. Under your current software I am unable to do so because the files are not on my computer. With the updates will I be able to back up files on my NAS drive too? I have very similar problems to everyone here and I welcome the idea of the updated software. Reiterating what everyone else has said is not constructive so I will wait for the imminent release, before further comment. The points I would like to address is similar to Bluemoonin65 I also have a NAS box setup as a mirror so that I have data on 2 drives, but I upgraded to 50MB broadband to have a 3rd place to store my data. If Vstuff backup is not going to accommodate that type of storage it probably is not the solution for me.... Please look to include the ability to upload via a network share at least. Also there are many other products that deliver cloud storage (sorry a little rant here...wow I couldn't believe the 250GB usb storage comment really short sighted..... forget the house burning down, what about a disk failure... IT WILL HAPPEN!!!!) Dropbox, Idisk etc these have iphone, android apps that allow access to their cloud storage solution. Will Vstuff ever be available on Smartphone’s? I want to finish by saying... yes….. Vstuff is not working well and I feel assured that Alex has been very straight about the failings. Therefore let’s stop moaning for moanings sake and try to influence the end products by offering constructive feedback!!!! Fair play for an honest and frank reply, but, repaying honesty with honesty, that's another reason to take my £100 per month somewhere else as soon as my contract expires. The whole reason that people complain is because we are offered all these wonderful services for this amount but when we sign up we find that there are actually a lot of caveats & conditions. We aren't paying for caveats & conditions. We are paying for a service. So please be honest again and offer me one good reason as to why Virgin Media are putting hurdles in the way of me using my "unlimited" backup. If you can't do that then please at least make it crystal clear in the promotional blurb what handicaps & limitations the service comes with. I needed to download my files backed up on V stuff due to hard drive problems yesterday - so I am a bit annoyed that I can't access them and still can't even though I had a call today saying it was up and running again. Should I be concerned that I may have lost my back up? V-Stuff is SO PAINFULLY SLOW Even with XXL WHY is that? I Decided to retreive my Backup today ONLY 1.1Gb 7 hours later and I am still waiting for it to finish. GOD what a JOKE. Hi There. I also have the problem where my account still states I only have 10GB of storage despite me upgrading to XXL package a month or two ago. Can someone please help! Tried calling but got cut off after holding for 20 minutes! Sorry for the delay in responding all - have been on leave! The rollout of the new release of Backup & Storage (as it is now called) is underway this weekend, so I'd suggest leaving until the upgrade has completed and then posting any further queries on the help and support forums (which you can find at http://community.virginmedia.com/). 'Anonymous' - I'll raise the apps idea with the broadband product guys. I know they're looking at apps generically also, something that we're investigating internally for other uses too. 'Bluemoonin65' - Thanks for that feedback. I think it's fair to say that the way that the product has been designed and positioned (based on customer feedback and research - we've done oodles of it for the next version) doesn't really fit with the requirements you've outlined as it's for a slightly different need, but the comments are appreciated anyway. 'Paul' - Please raise this with the forum team (see the link above) and they'll be able to look into it for you. 'Gopher' - Do please give it a go post the new update and pass any feedback onto the forum team direct. 'Brammer' - Same advice ... if you can put up a post in the forums they'll be able to look into this for you. Alex, the roll out of Backup and Storage seems to have overloaded the servers since everything has slowed to a near stop. This may have something to do with having to restore the backup in order to keep the same settings, which if everyone is trying to do this at the same time could understandably overload the servers. This seems to also be affecting the web interface which is painfully slow ATM, even worse than before the previous improvements to Vstuff. Have had the product guys check out the system load etc based on your feedback and all seems to be fine. Any chance you can post some more details up on the forums so we can get a ticket raised for further investigation? 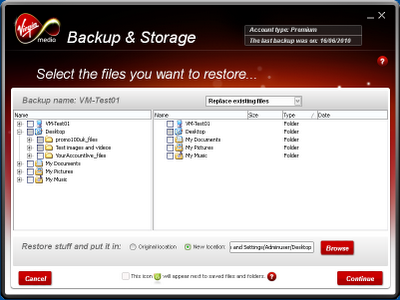 You only have to look at the forums to see how poor v-stuff backup is even after the 2010 and 2011 "improvements". Suggesting tech support will help is like a red rag to a bull. 5 pages of complaints about login issues and unreliability without a single helpful comment by anyone at virgin. V-stuff backup is unreliable so customers do not trust it. It is horribly slow (5GB of space that can take days to backup compared to minutes with things like dropbox). It is also easy to see how customers are completely disillusioned with phone support too. There are even discussions about trying to get you to appear on watchdog it is so bad. Hi Brian - Thanks for the feedback and apologies for the experience you've seen. I've passed this through to the product team responsible for Backup & Storage based on your feedback. Apologies about the slow response to your blog comment - busy times for me and all! I did like Backup & storage until one day when it wanted me to login and refused my password. The only option then was to restore or set up a new Backup. Reluctantly I tried again and all was well for two weeks and then the same happened again. 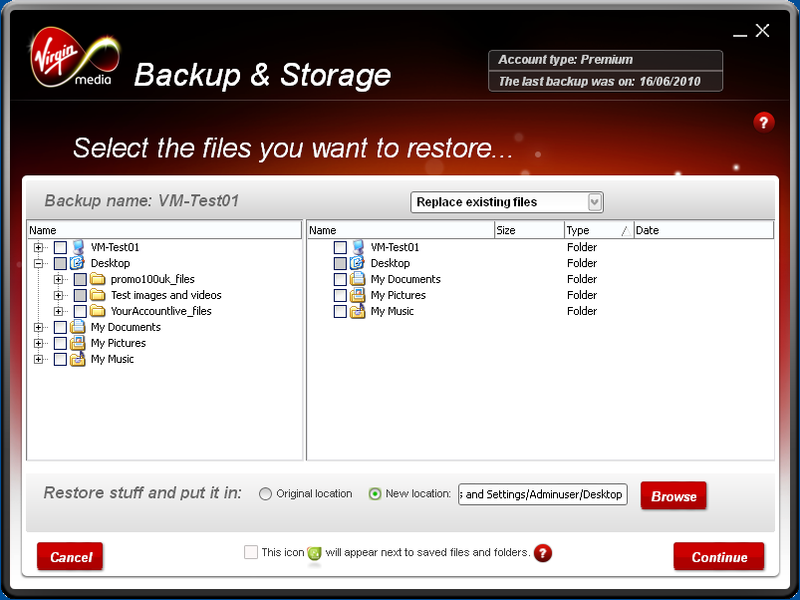 Now I have two backup sets on virgin media's server and there is no way to delete them. I can log onto my account and retreive data but this is now all out of date. I am dissapointed that I do not have full control of my stored files. How do I delete them and what are virgin media doing about this Login error? A search on many forums will prove this is happening far too often. I have just recently signed up to XXL to get the unlimited back up - like just everyone else on here. What "level" of fault do we need to be at to get some answers? How about the level of going to court for theft ? Just what the hell is going on? You cant offer a service and start taking people's money and then not deliver - i think that is called stealing ? Where do you get your developers from - they have to be straight out of school ? How can this be going on for more than a year. A YEAR !!! I commend you for running this blog. You must be very disappointed that the "improvements" you announced a year ago have proved to be so poorly delivered. The problems are clearly a result of poor design, probably driven by limited budget, followed by poor development and capped off by apalling testing (probably heavily reduced to fit both time and budget) the result is that it may have been delivered to an acceptable timescale for whichever ivory tower resident commissioned it but he or she is now responsible for thousands of very dissatisfied customers and has therefore failed in there key objective. Problem one: there used to be the ability to delete backups no longer required. you needed to be able to do this in the old software because it forced you to create new backups. Whilst you can avid creating new backups you can only do this by working out for yourself that you have to fool the software into thinking that you are restoring, then back out. Consequence is that there are too many back ups held and nothing you can do with them. Two: Recently every time another user logs on the backup stops by saying that your backup is in use on another computer. This is not true. My wife logs onto my main computer and is not set up to back anything up and does not need to. This only recently started happening. Could it be that I have set it up to back up my daughter's laptop? This should not be the case as she backs up to a new and different backup. Also I dont believe this is the cause as it often occurs when her laptop is not on. The software frequently loses it's connection to the internet - or thinks it does. the connection is fine and always on (one thing that virgin does well). Four: There should be an advanced control section so that the user can diagnose and resolve the issues. Many people would find this valuable and a means could be found to feed this back to your developers. Dont treat us all like idiots. In my opinion this software is now ten times worse than it used to be and gives me no confidence that my stuff is backed up as it just doesnt work in the background as it says it should. Is anyone from Virgin doing anything about this or does anyone care, Has anyone told Richard? Maybe I'll send this to him next. Nothing is for free, we pay for this as part of our XXL package. It doesnt work; Virgin are obliged to fix it. Thanks for taking the time to post that comment. There's a few things in here that don't read very well - apologies for those. I'm feeding this back into the product owner for when he's back in next week and will follow up with a discussion. Sounds like you could use one of the tech support guys helping out too - have you got in touch with one of the tech support guys via the forums (http://community.virginmedia.com) or would you like me to get someone to give you a call? I have to add that I've only just recently joined and one of the main reasons for selecting XXL was the backup and storage. We have 3+ computers and I'm fed up running around with a USB drive doing backups. After a dreadful initial engagement from VM just getting me connected...Imagine my disappointment when I come to use the product. It's so slow it's unusable, it's the easiest way to put it. The Backup my be unlimited but I'll be dead before it finishes it's first backup. It's only completed 80GB in 3 weeks and it's been running 24x7. As for the storage...the interface is slow and never completes a transfer. Very helpful messages such as "An error has occurred, please try again" and "You have been disconnected due for security reasons"...just enrage me further. The Service (if you can call it that) is simply not fit for purpose and I'm surprised someone hasn't taken this further i.e. legal. I'm a client of Virgin Atlantic and was foolish to think that the Virgin brand stood head and shoulders above the norm. I can't believe that Richard knows the amount of reputational damage VM are bringing to his group name. Hi - Do you mind getting in touch with the social media 'tweam' (contact details at http://www.twitter.com/virginmedia) and we can see if we can get one of the techincal support guys to help out? Sorry for the delay - this didn't appear in the web interface.